I love nuances, the small details, the differences between two fabric shades, various pattern size and shape, textures, and the like. Some believe that the big picture is what matters, but I’m one that goes into the details – sometimes even too deeply. Many designers work on similar subjects and similar ideas, but what distinguishes one work from the other is the nuances. The third model I present here in the blog is a dress with a spotted print, or what the professionals call ‘Polka Dot’. When I chose the fabric for this model, I looked for the “right dots” and a perfect match between the two colors of the fabric. There were many options – large or medium dots, in a wide variety of inter spaces. 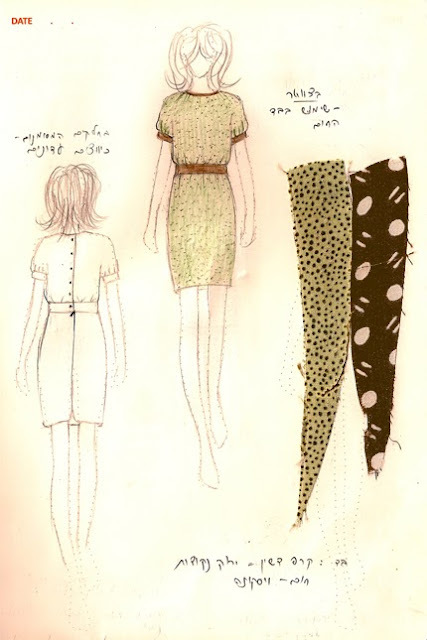 The green fabric I chose has small and very gentle brown polka dots, which create an interesting and unusual polka dot texture (In the photos you can barely see the polka dots, but in the sketch above you can find a small sample of the fabric that clearly shows them). The second fabric I used is Brown and has dots in a different size; the print is more graphic and noticeable. I love the combination between green and brown, but as I said – it’s all in the nuances. The dress shape is clean and classic, and works well on the female body. The round neckline is stressed by a diagonal stripe cut from the brown fabric; a little volume in the sleeve is created by small creases and a gentle hem in the sleeves’ end. The waist is emphasized by the dark colored fabric and the delicate approximation to the body. And finally, the back… which is also very important in my opinion; I chose to place small mushroom buttons along the back-line.